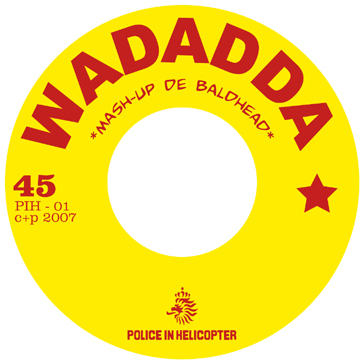 More excruciatingly limited business from Wadadda, this time brought to you on a beautifully executed little 7", complete with a big f*ck-off jukebox style centre hole for all you soundsystem purists. "Mashup De Baldhead" is just immense, one of those spacious, well crafted widescreen BASS numbers that pays as much attention to atmosphere and pace as it does to the underlying heaviness which will provide it with the inevitable peak-time rotation it will no doubt receive in the coming months. The vocal skank balances out the instrumental tension, but in true dubplate stylee there's a "version" on the flip to get busy with. Limited copies - LARGE!